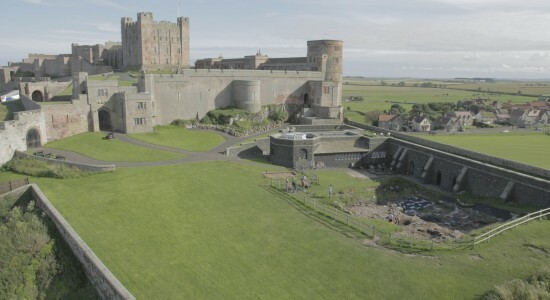 A review of The West Ward Excavation, Bamburgh Castle (Bamburgh, Northumberland, United Kingdom). The subject of the present article is a little different, concerning as it does the results of an ongoing archaeological excavation, rather than archival research. The preservation and interpretation of an archive will play its part in the story, as you will see, and we try to be very welcoming to volunteers on the dig if anyone wishes to consult the raw material themselves! A little about who we are is usually a good place to start. The Bamburgh Research Project (BRP) was set up in 1996 with the intention of studying Bamburgh and its environs. Bamburgh Castle is an iconic site that enjoys a special place in the history of the North East region of England. Its written history dates back as far as the early post Roman period, but its archaeology, investigated by Dr Brian Hope-Taylor and ourselves, tells a longer tale, back to the prehistoric period, as the earliest finds, so far identified, are worked flint of Neolithic date, recovered from the base of the archaeological stratigraphy during the re-evaluation of Dr Hope-Taylor’s first trial trench. The attraction of Bamburgh, that has led to its long occupation, is not hard to identify, representing as it does a natural rock fortress of some 3 hectares in area, rising between 15m and 30m above the surrounding plain. We know, as yet, little about the prehistoric occupation of the site, but we do know that it was one of the principal royal palace sites of the Kingdom of Northumbria, from the 6th to the 9th centuries AD, and later the focus of an enigmatic family who ruled what remained of Northumbria, north of the Tees, until after the Norman Conquest (Frank Stenton, Anglo-Saxon England, Oxford: Oxford University Press, 1943, pp. 72- 78, 253). Our current research is aimed at gaining a greater understanding of the palace of the Northumbrian kings and the earls that succeeded them. Such research is very reliant on archaeological evidence, as few documents survive. We are however fortunate in having a brief textual description, dating to AD 774, preserved in the collation of early documents attributed to Simeon of Durham. In a brief annal that describes the exiling of King Alred, the compiler of the record offers us a description of Bamburgh, as it was at that time: as the size of two or three fields and “having one hollowed entrance ascending in a wonderful manner by steps” (Simeon of Durham, History of the Kings of England, trans. Joseph Stevenson, 1887 (Church Historians of England, facsimile reprint 1987), p. 37). This description fits the natural cleft in the rock at St Oswald’s Gate, at the far northern end of the West Ward, where there are a series of stone steps leading from the external ground level up to the lowest lying part of the castle. The text goes on to describe a church “of very beautiful architecture” on the summit of the hill, almost certainly the Basilica of St Peter mentioned by Bede, as being present within the fortress by the mid-7th century (Bede, Ecclesiastical History of the English People, eds Bertram Colgrave and Roger Aubrey Baskerville Mynors, Oxford: Oxford Medieval Texts, 1969, p. 252). Finally we are told of a well, excavated from the highest part of the citadel, a feature still present in the ground floor of the 12th century keep. Although not mentioned in the text a royal hall must surely have stood on the summit of the fortress close to the church. The main focus of our excavation has been within the West Ward of the castle. Here we are following in the footsteps of Brian Hope-Taylor, who excavated at the castle during two campaigns in the early 1960s and again in the early 1970s. A short publication detailed this earlier phase of work, but little was known of the latter, and just as importantly no published plans de-marked the extent, or location, of the trenches (Brian Hope-Taylor, ‘Bamburgh’, University of Durham Gazette, New Series, vol. VIII, no. 2, 1960, pp. 11-12.). Given this starting point, our first trenches (Trenches 1 and 2), excavated from 2000, were located at the far northern extent of the West Ward, sited to investigate the defences of the fortress. They have identified some fascinating results but it is Trench 3, sited in the area known from aerial photography to be the broad location of Hope-Taylor’s 1970s excavation that is the subject of the present article. Trench 3 has been expanded over several seasons to reveal the full extent of the earlier excavation, which we now know was not completed but abandoned following a breakdown of communications with the late Lord Armstrong. It has been difficult to gain an understanding of just what happened, so many years later, but from the tactful comments of the former Estate Manager, it seems to have centred on the removal of finds from the site. Whatever the exact circumstances it must have been substantial to cause such an abrupt end to the excavation. As a consequence of this, as we revealed the earlier trench we discovered section strings and nails, used to draw features, still in place beneath the tarpaulins that were laid at the end of their last season. These findings were soon followed by the discovery of Hope-Taylor’s site offices, in rooms built into the nearby curtain wall. In these a kettle and newspaper and even a bottle of milk, thankfully empty, were found on a tables. Uncovering and recording a previous excavation in this manner was a strangely eerie experience, but the recovery of over 100 boxes of finds may prove to be very important if we are to complete the works started in 1970. In response to these discoveries we formulated a strategy to incorporate the study and ultimate publication of the previous work together with our own excavation efforts. This involves the excavation of our own trench parallel to the existing Hope-Taylor excavation, providing primary evidence of the stratigraphy and allowing, we hope, an informed interpretation of the previous excavation. The hope that we could be successful in completing the previous work was certainly aided once we had a digital copy of the Hope-Taylor archive, provided by the Royal Commission on the Ancient and Historical Monuments of Scotland (RCAHMS), who had been central to the recovery of Dr Hope-Taylor’s archive subsequent to his death in 2001. Amongst the plans recovered was a location plan for his West Ward trenches. These listed Cutting A, the already identified 1970s open-area excavation, together with the location of the 1960s trial trench. This trench was of particular interest as it was excavated through the full archaeological sequence to the bedrock and produced important early medieval finds, including two swords and an axe. Trench 3 is located in the central western part of the West Ward, where a natural hollow in the bedrock extends for some 80m north-east to south-west, between the higher outcrop on which the medieval cross wall that separates the East and West Wards stands and the outcrop with the post-medieval windmill. The modern ground surface of the trench lies at 27m Ordinance Datum (OD), but we have been able to measure to the bedrock in a number of places, not least the 1960 Hope-Taylor trench, so we know that 3-4m of stratified archaeology is present. The earliest archaeological horizon currently being excavated has proved to be highly productive of metal finds, particularly iron and copper alloy objects, but even includes some small decorated gold strips. This finds distribution lies in and around a pattern of stones that form the intermittent sides of a building, adjacent to a pebble path to its western side. The structure measures 2.6m by 3.3m and was oriented north-east to south-west. We believe the building was a timber one, and the stone foundations merely raised it above the soil level. At least three gaps in the stone foundation represent possible entrances. The surfaces in the area contain ash and charcoal spreads and the distribution of ash has helped to confirm at least one gap in the wall line as an entrance by the spilling out of burnt material; a further gap would appear to be confirmed by a concave area assumed to be a wear pattern. The third entrance, adjacent to the pebble path, was uncertain prior to the discovery of a barrel-lock in the centre of the gap. The association of the structure with numerous metal finds, together with layers of ash and burnt material, has led to its interpretation as a metalworking building. The finds assemblage would indicate a date in the mid-9th century AD for the building; this is a date that is confirmed by the presence of numerous Northumbrian styca coins found in and around the building, including a hoard of 77 coins recovered from the floor surface within the building. The coins were embedded within a very dark organic-like material with a fibrous component, identified as grass, sedge or rush, that was thought to represent a charred packaging material. More interestingly the corrosion product from the coins had preserved, in a few rare cases, traces of cloth. This suggests that the coins may have been contained by a cloth bag as well as the grass container. Initial identification by the British Museum indicate that the majority of the coins are of Ethelred II, and dated to c. 840-44 and c. 844-48, confirming the date indicated by the other small finds. The identification and dating of the metalworking area is significant regarding our wider understanding of the West Ward and of Hope-Taylor’s first trial trench. We knew from the short written report that the two swords and axe came from this trench, and working with the Royal Armouries, Leeds, we had found them to be pattern-welded and of sophisticated workmanship. Access to the Hope-Taylor’s records allowed us to locate the trench immediately to the east of Trench 3, and when we emptied the trench of its backfill to re-record it, we found not only that some finds tags survived stuck in the sections, but that they were still legible. It was natural to hope that one would mark the swords’ location, but we were not so lucky. Our luck did change a little later, when one of our trench supervisors was working as a volunteer on the Hope-Taylor archive held at the RCAHMS in Edinburgh, because amongst the records for another site she found the (up till then) missing 1960 drawing of the trench section, complete with the location of the sword and axe find spots. It seems the swords were recovered from a layer broadly at the same level as our metalworking area, which means that they may have been part of the assemblage associated with our smith’s workshop. It was relatively easy to date the layers from the 12th century and later during the early phases of our excavation, as considerable quantities of pottery were present. We know that between the 12th and the 15th century the West Ward was used as a midden. Dating, and understanding, the pre-12th century stratigraphy, where pottery was incredibly rare, was very problematic and the identification of a securely dated horizon for the mid-9th century was a very helpful development. Understanding what lay between the 9th and 12th centuries was important to us, because one of our aims was to investigate the period between the advent of the Vikings and the Norman Conquest as this was a period in Northumberland that is not at all well understood. This stratigraphic sequence was not very thick, being only 0.2-0.3 m, which could have been the result of a period of limited deposition or of relative abandonment of the site. We did though have one intriguing feature that could be dated to this period. A stone structure comprising a series of roughly dressed slabs set as a flat surface has been interpreted as a substantial stone threshold, appropriate for a large building. The absence of any further structural evidence, such as post-holes or construction trenches, would suggest a ground-standing building. It was clear that the western side of the trench contained a particular concentration of ash and charcoal at a similar stratigraphic level as the stone threshold, and examination of the excavation plans of this area over a couple of seasons indicated an amorphous but still clear linear spread of ash and charcoal to both north and south. The evidence is not conclusive, but it is at least a reasonable hypothesis to see this linear burning event as the remains of a very substantial timber wall. The burning was traced for 5m to the north, where it reached a flat area of bedrock, and for at least 7m to the south, as far as the limit of the trench. A large building indeed, and stratigraphically right for our missing 10th century phase. It is clear from the excavations undertaken within the West Ward of Bamburgh castle that archaeology of great significance, and in places of substantial depth, is present and well preserved. Occupation of this naturally defensive rock fortress can be dated back deep into prehistory and would appear to continue without obvious hiatus up to the later medieval period. The high status focus of the fortress can be placed in the Inner Ward at the summit of the rock by textual and archaeological evidence, but nevertheless it is clear that the West Ward, at the lowest part of the fortress, was also densely occupied during the early medieval period. This indicates that it is likely that the whole of the defensible fortress area was utilised at that time. The metalworking area dates to just before the arrival of Scandinavian settlement in Northumbria and the fragmentation of the kingdom, at the end of what has been called the Golden Age of Northumbria. It is clear, from the deeper sections of the Hope-Taylor excavation, that layers of ash and fire waste extend beneath the current 9th century level for some depth, suggesting a long period of industrial activity in the middle Saxon period. Hopefully we can look forward to further discoveries of the craftsmanship and creativity that must have supported the royal court at this important time, together with further important clues regarding Dr Hope-Taylor’s earlier discoveries. Image: The West Ward of Bamburgh Castle with Trench 3 on the right side. Courtesy of the author.